I’m not certain whether it is the closeness to nature I experience living aboard The Red Thread or whether my farm girl roots are longing again to grow or if it is simply that spring has come, but I’ve been mildly obsessed with the idea of establishing a boat farm for the past few months. I decided to start small by tackling a green project that with little effort would likely be successful and yield a quick harvest. I’m a psychologist, after all, and I appreciate that good old-fashioned reinforcement never hurts. Growing sprouts seemed like a good option, as many seed varieties produce a harvest in just a few days and the only real requirement is the ability to consistently water them. In addition to being simple to grow, sprouts are also incredibly nutrient-dense. Sprouts are richer in vitamins than many mature plants and can be eaten raw on salads or sandwiches or cooked in stir-fries and soups. For growing sprouts, many people use mason jars with sprouting lids. However, because boats rock, we’re clumsy, and shattered glass is horrendous to clean up (yes, we’ve learned the hard way), we try to avoid having glass aboard. 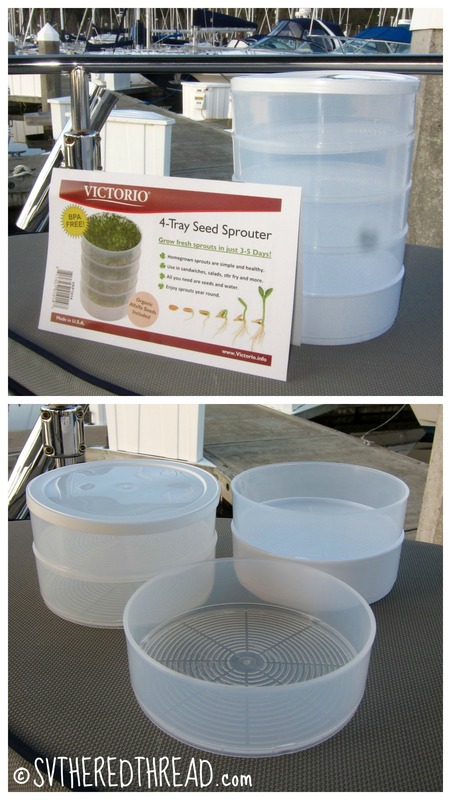 I chose to purchase a Victorio 4-Tray Seed Sprouter. Having multiple trays is a nice feature, as it allows me to grow small or large crops, depending on how sproutastic I’m feeling. The sprouter also fits nicely into our galley sink, which will be ideal when underway. Step 1: Rinse the seeds. Step 2: Soak the seeds for 8-12 hours. Step 3: Spread a tablespoon of seeds onto each tray. Step 4: Pour two cups of water onto the top tray of the seed sprouter twice per day (rotate trays at each watering). The water will drain into the tub at the bottom. For cruisers who may have limited water access, the drained water can be recycled to water other plants but should not be reused on the sprouts. Step 5: After 4 to 6 days, harvest, dehull (I’m too lazy to dehull and don’t mind the extra crunch), and dine! My understanding is that any seeds can be sprouted, but since I’m new to all of this, I opted to try out some combinations created by people who actually know what they’re doing. I recently grew a couple of seed combinations purchased online from Sprout People, a company with a good reputation for selling high quality, organic seeds. The hot and sweet sprout mix was particularly good. I have several other boat farm projects in the works…stay tuned. If you have any thoughts, ideas, or recipes, I’d love for you to share them! This entry was posted in Boat Life, Boat Projects & Maintenance, By Jessie, Galley, Sailing the Farm and tagged boat farm, seasteading, Seattle WA, sprouts. Bookmark the permalink. I can’t wait to get sprouting! For me though, I’m going to wait until I’m not working everyday- I forget to water them. I’m thinking sprouts will be our new “lettuce” on sandwiches. I’d love to read updates as you try new sprouts and recipes. Yes, I envision sprouts becoming our sole lettuce eventually as well…though technically, I’m trying to grow lettuce right now, too. I LOVE them on salads and in stirfries. I hope to get a bit more adventurous soon!